Shadowcat: Tales from the Edge of Sleep features seven short stories set in the future, and on other worlds, and in this one, which is strange enough when you think about it. To share the future of our world and others, today I’ve been joined by Victoria Randall, author of ‘Shadowcat: Tales from the Edge of Sleep’. Victoria, where the spark of this novel start? I swiped a few of the primary characters from my son Brandon Graham’s popular graphic novel King City (with permission). In that book Shadowcat is a minor character, but he intrigues me so I made a story around him. He’s a weaponscat, that his handler can use as a weapon given the correct chemicals injected into him. I expect that you haven’t spent much time injecting chemicals into cats, but where there over events in your life that you wanted to explore through any of the worlds in your short stories? I’ve never met a talking sandwich, a weaponscat, or an alien in disguise (unless it was a really good disguise and I didn’t recognize him). But I have met people, who form the basis for the stories. You know I’ve never met a talking sandwich, a weaponscat, or an alien in disguise either, but they are some fantastic characters! These characters really all feel like they have a little scifi injected directly into them, which leads me to think about monsters. If you invented a monster what would it look like and what would you call it? I have a monster in Shadowcat. He’s the son of Cthulhu and a mermaid from the Danube, named Tsunami Cyril. He can change his shape, grow to monstrous size, and destroy cities, but his main problem is that he’s a teenager and afflicted with hormones. When he attacks Seattle, the heroine manages to calm him down with her weaponscat. That is quite a tale! When you’re working on these tales, is it important to you that they share a deeper story with your readers, and if so what messages do you hope readers find in this novel? These stories are just for fun, but I like to emphasize the importance of courage and loyalty in my tales. What personally has rewarded you the most while getting stories of courage and loyalty in this book onto paper? It’s just fun fleshing out the tales, and seeing where they go. And when you follow the path of these tales you always learn something new. What did you learn from Shadowcat: Tales from the Edge of Sleep? The learning curve for formatting is horrendous. I enjoy learning new things as it keeps my brain active. There is so much to the world of formatting! But now you have these skills you can apply them to your next work. Speaking of your next work what can you share with us about it? Promoting the second in the series, The Golden Helm: More Tales from the Edge of Sleep, which is 12 more fantasy and science fiction tales. When you’ve decided that you’re going to write another book, like adding The Golden Helm, do you know the end destinations of each of the short stories? Or do you find the destinations after you start writing? It’s essential to have an idea of the ending, but the fun part is discovering how to get there. It’s amazing what the mind will come up with when you give it a task. How has your writing style progressed as you have continued to give your mind new writing tasks? My style is minimalist. I try to convey a scene in a few details as possible, while still providing enough to make sense. That’s probably why my stories are so short. And having them shorter would also make them easier to edit. Do you edit your own work? I edit them myself; I can’t stand typos. I find them in other books as well. Being a nurse, I have an eye for detail; it’s essential to be on top of the little things. There are so many little things in the world of writing. To end today’s interview, what are the little things that you feel authors should be on top of? Find a writers’ group to belong to, and a few beta readers. Write what you enjoy reading; we probably have enough romantic vampire books. Always write what you enjoy. Victoria, I hope you’ve enjoyed writing these stories over the years and I hope you continue to write even more in the future. Excited to read the book we discussed today? Find it here on Amazon: ‘Shadowcat: Tales from the Edge of Sleep ( ASIN: B013N1A01Q )‘. 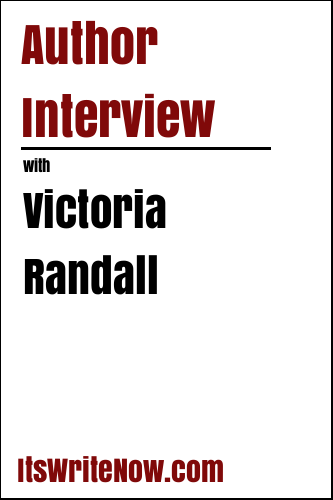 Want to find out more about Victoria Randall? Connect here!